Ten thousand people turned out to line the streets of Cork on June 19th, and more than 4000 filled St. Oliver's Church and grounds as an Irish blues legend was laid to rest in his home soil. Alongside church mourners, the famous battered Fender Stratocaster joined the world to say farewell to a charming, modest man who spent more than 25 years delighting audiences everywhere- Rory Gallagher. Born 47 years ago in Ballyshannon and raised in Cork, Rory died on June 14th suffering from pneumonia following a liver transplant operation. He had battled against illness for some years and was touring Europe up until January when his health problem became acute. He worked until the very end and was writing for a new album and had a UK tour planned for this summer. As a soft Irish rain fell during the funeral service, Rory's long time harmonica sideman, Mark Feltham, played Amazing Grace accompanied by Gallagher's former keyboard player, Lou Martin , who also played one of Rory's own compositions, A Million Miles Away. Amongst mourners at the service were U2's The Edge and Adam Clayton, Martin Carthy, members of the Dubliners, Clannad, and Gary Moore. Pallbearers were members of the Gallagher family, Rory's devoted brother and lifelong companion/manager Donal, Mark Feltham, drummer Brendan O'Neil and Rory's bass player for more than 20 years, Gerry McAvoy. Tributes from the music world have poured into Rory's London offices- Jeff Beck, Eric Clapton, Bob Dylan, Bert Jansch, Davy Graham, and his close friend, Van Morrison being amoungst those who have sent personal messages of condolence. A memorial service is being planned in London for early September. Rory Gallagher first shot to fame with the band, Taste in the late 1960's and made an impact on the European and UK circuit as well as cutting come memorable albums. Perhaps the best " On the Boards:, showed Rory's talent not only with a guitar, but on the saxophone as well. One of the bands highlights was the 1970 Isle of Wight festival which the BBC will screen this month as a tribute to Rory. Taste were also chosen to support the The Cream farewell concert at London's Albert Hall. With the demise of Taste in 1971, Rory teamed up with Belfast bassman Gerry McAvoy and drummer Wilgar Campbell to strike out on a career of rocking electric blues and create one of the hottest, hardest working trios of the past two and a half decades. I was a fan of his music in the 70s and we became friends in the 80s, which gave me the opportunity to write my first interview for Guitarist in 1985. Over a couple of beers by the pool of a Spanish hotel awaiting his turn to play the Calpe Rock Festival, Rory told me how his childhood influences were cowboys who played the guitar- Gene Autry and Roy Rogers. He got his first chance with a ukelele before moving on to an acoustic guitar at the age of nine. Although he was listening to Chuck Berry, Buddy Holly and The Shadows, it was the likes of Big Bill Broonzy, Leadbelly, Blind Boy Fuller and Muddy Waters who would leave a lasting impression. Having tussled with skiffle hits chord books, Rory became self- taught and progressed to giddy heights of a Rosetti Solid Seven guitar with a Selmar Little Giant amplifier before moving up to a Hofner Colorama. His most famous purchase happened when an Irish showband guitarist wanted a red Fender Stratocaster just like Hank Marvin's. A sunburst model arrived in the store- the showband man insisted on waiting for a red one, so Rory snapped up the sunburst and the rest is history- especially the sunburst finish! At the age of 15, Rory was playing in, then popular, Irish showbands performing cover tunes of the day. A chance to break away and play the music he loved led him to poaching a couple of fellow showband musicians and branching off to tour Europe's steamy clubs- this was the beginning of Taste. Sucees in his own right came in the early 70s when Polydor released 'Rory Gallagher' followed by 'Deuce' quickly followed by 1972's "Live in Europe' - a classic featuring many future favorites, such as Messin with the Kid and Bullfrog Blues. 1972 was also a red letter year for Gallagher when Melody Maker readers polled him the no.1 guitarist - beating Eric Clapton into second place! By now Gallagher was big news on the UK scene and immensely popular at European festivals - something he would continue to enjoy throughout his career. His reputation as the live act was embellished by his image - long streaming locks, tartan shirt, Levi's and of course his well worn Strat. Rory's great strength was the live performance and few could match his incredible fire and enthusiasm when he hit the stage. The first time I saw Rory perform was in 1973 at the Liverpool Empire. He menaced across the stage, Strat tucked into his shoulder like an AK47, and proceeded to 'machine gun' the audience before bursting into the opening number. I was hooked, and bought a tartan shirt the very next day. Throughout the 1970s, Rory's career blossomed - success in America meant a greuling schedule of three tours a year. Japan was another hot spot and the UK and Europe were just as popular. During this period Gallagher had a succession of drummers, but the one constant was bassman Gerry McAvoy who would stay with him for 20 years and develop an almost sixth sense for Gallagher's mid song diversions and improvisations. World wide acclaim created the opportunity to guest on recordings of many of Rory's peers, among them Chris Barbar, skiffle king Lonnie Donnegan and blues greats like Muddy Waters and Albert King. Rory also recorded with Jerry Lee Lewis, a man whom he often spoke of with great affection. 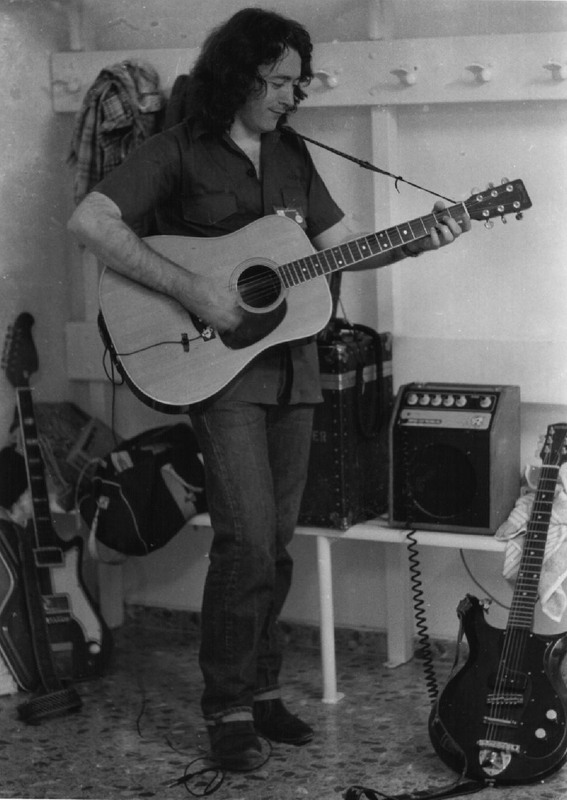 Throughout this "Strat storm,' it should rightly be mentioned that Rory's other great love was acoustic guitar - mid set he would take a solo spot with his trusty Martin and no one could forget his famous renditions of Leadbelly's Out On The Western Plain or other favorites like Pistol Slapper Blues and Walking Blues. Rory would later prefer the versatility of a Takamine for live work and always recommended to students that they should 'toughen up' and train on an acoustic. Gallagher always wanted to release an album of acoustic music - not the MTV unplugged type, but folk/blues inspired by Celtic influences. For essential Rory listening - 1980s live recording 'Stage Struck' rates very highly for sheer electric power. Look out for the tracks Follow Me and Brute Force and Ignorance. The whole album is penned by Gallagher and also features his slide playing at which he excelled. Other classic albums include Rory's own favourite, "Top Priority" from 1979. That 1961 Strat was, of course, Rory's first love but he often used and preferred Telecasters and Esquires for their lead pickup sound. In the studio he would have an arsenal of instruments from Fenders through to Gibson Juniors, Gretsch Corvettes for slide - even a Supro and a metal bodied Tokai Talbo. His on stage setup was low tech by todays's standards - no racks, stacks, or wireless transmitters. Rory preferred his faithful old Vox AC30 linked to a 50 watt Marshall with a delay pedal between the two. There would be a few battery powered pedals scattered on the floor -mainly an octave divider and a Tube Screamer. A signature effect was to frantically roll the tone control on the guitar to obtain a wah-wah. Between gigs, Rory would frequently change the neck on his Strat because the bare wood became impregnated with perspiration, often remaining damp for days. I remember arriving at his Fullham office one day from Chandler Guitars in Kew. I had just picked up one of Fender's "The Strat' models, resplendent in Lake Placid Blue with gold hardware. In retrospect, it looked like a tart's handbag, but I thought it was cool at the time. Rory opened the case, took one look and said "you know, Bob, that could be a really nice guitar if you took off all that gold stuff and scuffed the paintwork up a bit!" Enough said, I was put off using it for life! Rory's quiet, unassuming lifestyle was reflected in his working environment: there were no extravagant suites, touring entourages or technicians running all over the stage. Instead, his business was handled by his brother, Donal, assisted for many years by secretary, Diana Worthy from a small office off the Fullham Road. On occasions, Rory would have the company of Arthur Cookson - a genial Geordie giant. But Rory's main man for taking care of equipment both on and off stage for so many years was Tom O'Driscoll - a softly spoken Irishman with a look of Santa Claus. It would have been Tom who would oversee everything from driving the truck to the venue, setting up the rig and taking care of any onstage problems. There is a substantial back catalogue of recordings and videos to keep Rory's work alive. Although the man may have moved on to join 'heaven's house band' with the likes of Stevie Ray Vaughan, Muddy Waters and Elmore James, the music he has left for all of us to enjoy will last forever.. Rory was never a man of many words on stage- he often introduced a song by saying modestly, "Here's a tune you may like".....and when he finished it it would be "Thanks a million" From all of us , Rory, Thank you a million. Article supplied by shinkicker and moonchild.